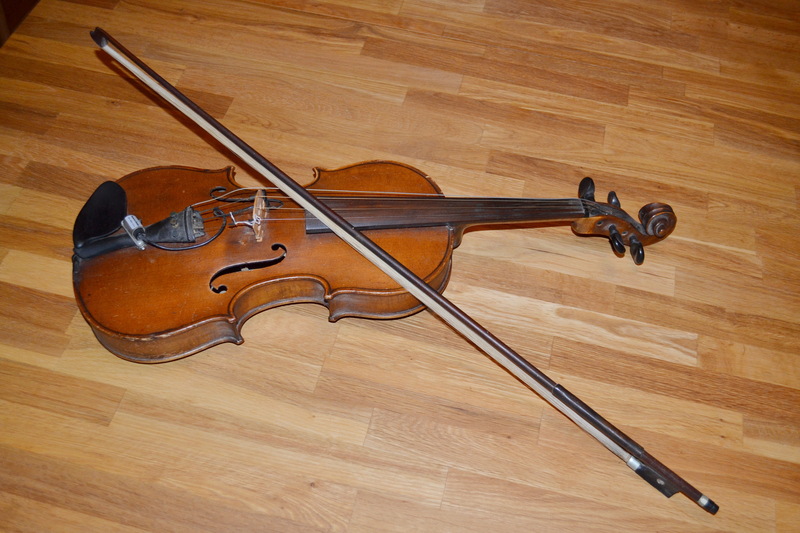 I have a violin, which may seem strange, as I can’t play a note. Next month I will have had it for 20 years and I still don’t play a note. It is my father’s violin. I say “is” because even though he died 20 years ago it will never be mine. It will always remind me of him – playing in the evening, in a group or even doing a duet with one of his granddaughters on keyboard or recorder. The violin goes back as far as I can remember in my distant recollections – back to Holland. My dad had many musical instruments over the years: pianos, harmoniums, keyboards, recorders, pan pipes … He tried all sorts, even a guitar but his fingers were too short for the neck which made the violin ideal. He played by ear so it was not always enjoyable when he first got hold of a new instrument. But the violin is the oldest. It is the one instrument that is always part of my memories of my father. Yes there are many other memories like dad packing my mother’s vacuum cleaner into a soundproof box so it could push air into the harmonium with the result that he didn’t have to pedal – and mum didn’t have a vacuum cleaner. 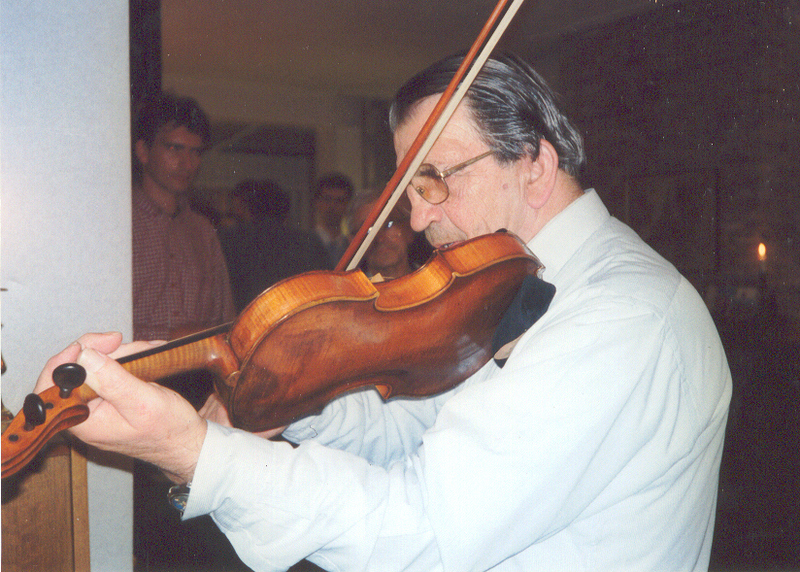 Yet over all these moments the image of my father and his violin remains the most enduring. It will be 20 years next month when my dad was promoted from being an earthly fiddler to a player in heaven’s orchestra with some of his favourite composers and musicians. I can imagine dad under the musical direction of J. S. Bach. But even after 20 years I still miss his playing – the good and the bad. 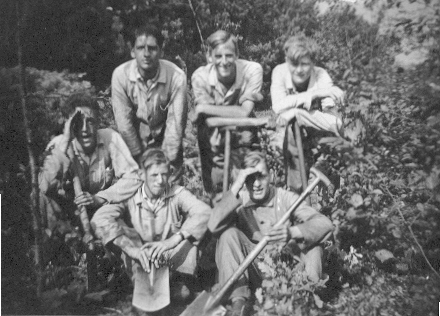 My dad and fellow workers in WW2. Dad is top left. 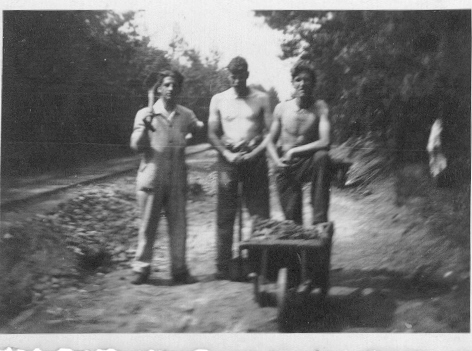 My father worked north of Berlin in a place called Hennigsdorf on the Havel river. In 1945 he and his fellow workers were liberated by the advancing Soviet armies. The workers found themselves in the midst of extremely harrowing battles as the German army made its last ditch stand. One of the few detailed stories my dad told me about this part of his life centred on this liberation. By 1945 his clothes, and in particular shoes, were in a state of extreme deterioration. One of the liberating soldiers motioned (language being a useless option!) to my father that he should find a German soldier’s corpse with the right boot size and “liberate” them for his own use. I gather there were quite a few and they all wore high quality boots. But even after years of war my dad was still squeamish about such matters. The Russian soldier, seeing my dad’s reluctance, took off his own boots gave them to my dad and then went in search for an appropriately sized and equipped corpse. Yes, it is a strange story, yet I have always seen it as an act of unusual, but real, grace. This was one of only a very few experiences that my father ever shared with me about that time of his life. The grace shown in the midst of horror was a memory he could share. The last part – for the time being. As I grew up, particularly in my teen years, I began to realise that Christians weren’t perfect and conflict was an inevitable part of church life. It became obvious that the words and actions of adults didn’t always match, and that motives were not always pure. One became aware of the cliques and groups – people with different attitudes, agendas or values. In the early 1960s our church had a very conservative, very Dutch minister. In order to attend communion, which was held every three months, you needed to attend church twice a Sunday. My dad, also Dutch and stubborn, had refused to travel to Geelong twice a Sunday after his little church in Ocean Grove had been closed. “If they close my church, I am only going once!” So the scene was set for conflict. Every three months before communion my family would receive “huisbezoek” – a home visit by the elders and minister. I was allowed to attend the formalities: coffee, Bible reading and prayer. Then I was sent to my room. However I could still hear the “conversation” between my father and the minister clearly through the walls. Dad didn’t give in and neither did Dominee K.
As I stated earlier, Dominee K returned to Holland and we had a new minister who simply asked my dad, “Do you love the Lord?” To which my father replied, “Of course!” and so he was allowed to return to the communion table. And my father started going to church, twice on a Sunday! The arrival of the Pentecostal movement had far more profound effects. The church became divided, some families split and there were married couples who lived in tension for decades to come, with the death of a partner greeted with relief rather than sorrow as it ended an unhealed past. The power of deeply held beliefs to unify is profound, but its power to divide is monumentally tragic. Looking back, I can now see the attraction of the charismatic outbreak. There was a joy in God and worship, a recognition of the power of the Spirit and an overall enthusiasm for faith and outreach. At the time there were also excesses and extremism. But that was true of both sides. Both groups saw right on their side. I don’t want to enter into the theology of this division at this point but rather consider the attitudes that people held that didn’t reflect Christ. As a young person at the time I was bewildered. How could beliefs, people and values shift so quickly? On the other hand I was in a privileged position as the two key leaders on both sides of the debate had a profound impact on my life. They were both men who loved the Lord deeply. Their followers were not always that wise. Blacks were made blacker and whites whiter. I have come to reflect that we often justify our attitudes by hardening our positions. There are times when we may need to separate or part ways due to deep disagreements but this can still be done with grace and Christ-likeness. This is particularly true when the heart of the gospel is not compromised. Over 45 years later, I now work in a school where fellow Christians from a wide variety of evangelical backgrounds respect each other’s differences and work together for the common good of Christ’s Kingdom and Christian education. These changes didn’t happen overnight. It took many, many years. I rejoice often that I have lived to see a day when the values of two men I respected dearly have come to coexist and empower the place where I work. More importantly, I believe because of this healthy co-operation, we can see Christ and His kingdom more clearly. Hah! But that callow youth back in the late 1960s did not have clue of what God had in mind. This is part 3 of my early recollections of church. 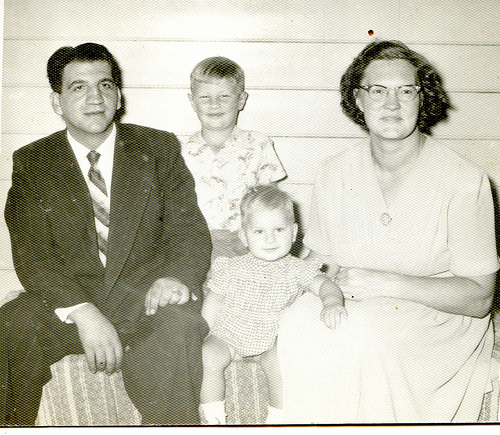 In the mid 1960’s the church to which I now belonged rented a Methodist church that only had a few members left. After a couple of years we purchased the building and added to our congregation a small number of aged Methodists who refused to leave the building they had been part of for their whole lives. One of the “fixtures” was Mr. Robinson who, in his earlier life, had shown 16mm films in the local schools. He was also an expert on first aid and was always willing to give our youth group demonstrations. As we had Dutch parents and grandparents, Mr Robinson was our connection with the new culture in which we lived. At the time it seemed all so “accidental” but looking back Rev. Deenick and God were in close collaboration. But I am racing ahead of myself. When I look back, being a Christian was a serous matter. It was not about having fun – and I am ok with that. Awe, obedience and doing things the right way were explicitly and implicitly drummed into us. Then in the second half of the 1960s an upheaval occurred. One of the professors from the theological college (the “house” I mentioned previously) started teaching the doctrine of a second blessing with the baptism of the Holy Spirit*. To be blunt, theological war broke out and my parents were in the middle of it. As a teenager I pretended nothing was happening, after all, even though church was important there were also music, girls, cars and a bit of study to consider. Little did I know then that this was part of the Pentecostal/Charismatic tsunami that was to hit Australian churches, and whether I liked it or not, I would have to reflect deeply on the Bible and what I believed. * Both these men, Rev Deenick and Professor Schep, in opposing theological camps, are mentioned under my blog heading: Melchisedeks. By my mid teen years we were worshiping in Geelong. 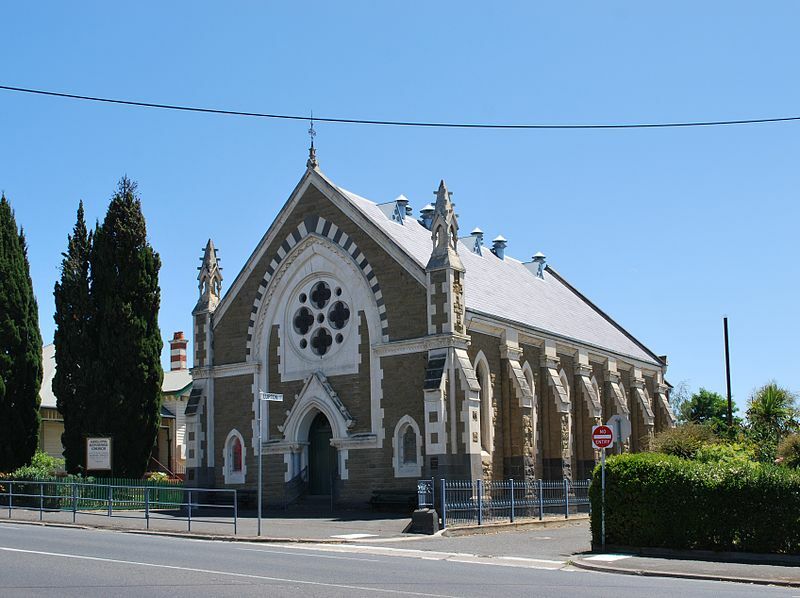 This congregation, which was much larger, did not have its own building yet and had also moved several times – from a Temperance Hall (with amiable rats) to Church Halls. At this time I attended “Catechism classes”, also in relocated army huts. (A story for another occasion involves the Friday after school Catechism classes held at our home. But that deserves a special heading of its own). Previously we had had Saturday Morning School. Every Saturday morning, (as the name suggests!) the children from Ocean Grove were herded into a windowless van my dad normally used to cart veggies, and were sent to a house in Geelong, which also doubled as a theological college, (these dutchies weren’t shy!) and we spent two hours learning about the Bible, Church History and creation while our Aussie friends played football, tennis or cricket. I must confess they were not my favourite two hours of the week. It was an attempt by our parents and the church to compensate for the lack of Christian education, not as I suspected at the time, a form of sadistic adult cruelty. Around that time, due to the closure of our church, we started attending church in Geelong which had a very traditional dutch minister. When asked what the church was doing for evangelism, his honest reply was, “We open the doors of the church every Sunday.” He soon returned to Holland (and, I believe, to a “black stocking” church) and a new minister arrived who had a profound impact on my life. Rev. J.W. Deenick was a staunch Calvinist who had an amazing sense of the the Christian’s role in the Kingdom of God. With the gift of hindsight I realise that he planted some of that in me. guitar in sight. I recall on one occasion being reprimanded by my dad for wearing corduroy trousers, “Would you visit the Queen wearing those pants?” “She hasn’t invited me,” I thought but didn’t dare express. However, now with the new minister there were activities to get involved in; Holiday Clubs (or Vacation Bible Schools) to run and Beach Missions to organise during the summer. For a keen teenager this gave purpose to a Christian’s life. Looking back, it was a time when we began to shed our ethnic hangups and sought to become part of Australian society and bring our own unique contributions: coffee, Calvinism and cigars – not necessarily in that order. All the while we still had our dreaded catechism classes after which followed the more enjoyable youth club time with its topical studies, business meeting and games – as well as meeting girls. This is where I discovered my wife – after a few false starts! Tomorrow I want to explore my entry into Christian education. 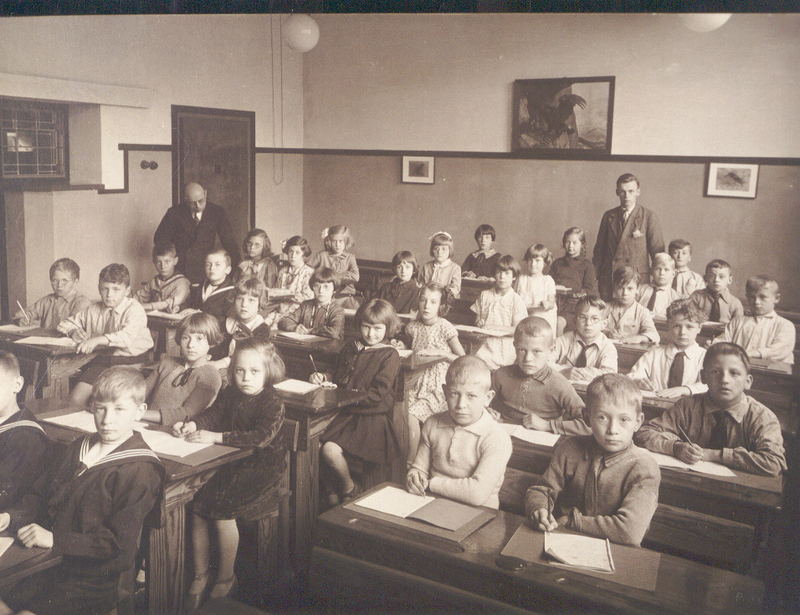 When I reflect on this photo of my father’s class in the 1920s I marvel and tremble at how much our world has changed; culturally, technologically and especially, spiritually. 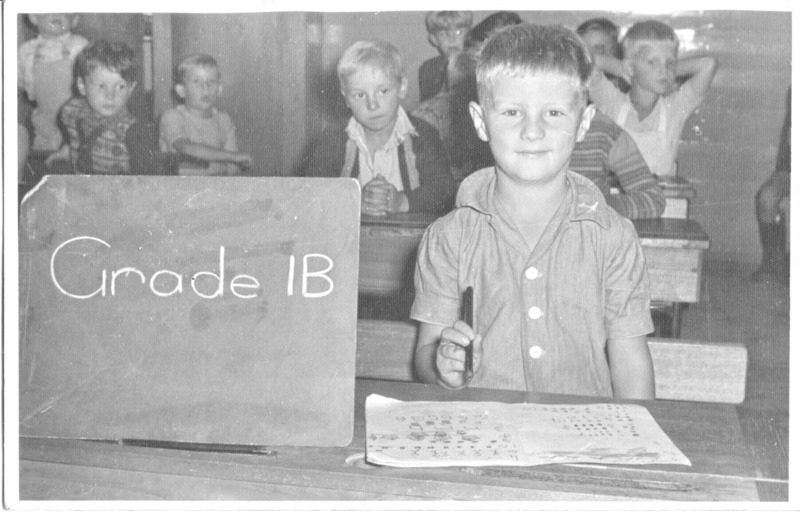 Little did my dad know when this photo was taken that he would he forced to spend many years working in Germany and that later he would immigrate to Australia. One thing that remained strong throughout all this time was the faith of the family. A faith that is still carried forward in our family today. When I grew up in the 50s and 60s the forces of the world, cold wars and the like, continued their machinations but the faith of the family continued. The first hints of the technological revolution could be seen. I replaced my crystal set with a Japanese made “trannie” (transistor radio). However, at school, the teachers even if they weren’t active Christians still carried a Christian ethic. Some things remained the same – for the moment. Then came the social upheavals of the 60s and 70s; from the pill to Vietnam moratoriums. The social structures of family, relationships, morals underwent enormous change. That is the foundation of the world today’s young people and children came into but they had the added influence of the IT revolution which has changed the way we interact, communicate, exchange ideas, portray self, acquire, educate and so on. My point is this: Change has always occurred. None of us is immune, but the nature of change in the last 30 years has been one that very few us were prepared for ( prepared in an educational sense) and even today, very few of us know how to prepare our children for. For me, the security in the midst of all this has been the certainty of God and His Word. With all this change, one thing is concrete and certain and that is the gospel of Jesus Christ. His claims on me and my children and His vision of a community and kingdom continue on, regardless of any cultural, technological or moral changes that humanity may decide upon. I suppose the one caveat I have is this: Because the changes in recent times have been so enormous (beyond the wars and rumours of wars), our teaching, revealing and living the gospel to our children needs to be more intentional than ever. More than ever, sound teaching and training, and especially sound example is required for our children to thrive in whatever the future may bring. How we do that in our schools is a story for another time. As someone once said, “We have a brilliant education system to prepare our children well, for the 1950s. That is for another time. Could I be content in a work gang? Above, is a picture of my dad as a 23 year old in a World War 2 work gang in Germany. During WW2 he was conscripted by the Germans to work for the Reich. Some of the best years of his life were handed over to a foreign power. As a baby boomer I have often wondered how I would have reacted. In the words of Paul, would I have been content in any and every situation? I don’t think so. Even now, I feel angry on my father’s behalf, for those stolen years. To be content in any circumstance means we need to re-prioritise our lives away from our wants to the conviction that our relationship with God and our place and purpose in His Kingdom is where our true identity lies. Easier said than done. That is true for me but I don’t believe I am the only one. How do we refocus our lives? In the wonderful film “Life is Beautiful”, the dad, Guido, deflects his son Joshua’s attention away from the horrors of the concentration camp by suggesting they were involved in a game which had a real tank as the main prize. Guido constructed an alternative meaning to the reality they faced. This new meaning provided hope and possibility. Paul reminds us that in Christ, the Christian is already part of an eternal alternative reality. The Christian’s task is be a willing participant in bringing that new reality about. So the current world, although not unimportant, is not where the Christian finds his or her identity. Paul prompts us to acknowledge that God knows our needs and for provides them, and much more as well. To be content means not to find ultimate meaning in, and be obsessed with, what the world offers or fails to offer. But as I said, that journey is a daily challenge … for me at least.